Special Feature: Monitoring, Measuring and Modeling Atmospheric Mercury and Air-Surface Exchange -- Are We Making Progress? Anthropogenic mercury is emitted predominantly to the atmosphere and the atmospheric mercury burden is roughly three times higher today than in preindustrial times. Mercury cycles between environmental compartments, but atmospheric transport determines its short-term distribution globally. Predicting the future impact of anthropogenic and legacy mercury emissions, and understanding the spatiotemporal distribution of mercury and its compounds in air and precipitation, requires improved monitoring networks and techniques. This Special Feature brings together some of the highlights on measurement techniques, atmospheric mercury measurements and modeling efforts from ICMGP-2015, Jeju, Korea. Measuring speciated mercury on the flanks of Mount Etna, Sicily during one of the European Tropospheric Mercury Experiment Program (ETMEP, part of the Project, Global Mercury Observation System (GMOS)). Volcanoes are a natural source and in order to understand the anthropogenic impact on the biochemical mercury cycle we also need to understand the natural emission component [Photo by CNR-IIA]. Measuring mercury on the ground and on board a Rockwell Turbo Commander at Mount Etna (3300m), Sicily. The European Tropospheric Mercury Experiment Program saw the aircraft spiraling through the volcanic plume [Photo by CNR-IIA]. View of Station Nord research station at the northern tip of Greenland. At Station Nord Mercury has been measured (with some breaks) since 1999 [photo by Bjarne Jensen]. (formerly Terra Nova Station), Gerlache Inlett, Victoria Land, Ross sea [photo by Italian National Antartic Programme]. Measuring atmospheric mercury on a cruise in the West Atlantic Ocean. The Tekran system to measure mercury with is located on the side of the ship. During the campaign atmospheric and surface ocean gaseous elemental mercury was measured in order to investigate changes in air-sea exchange fluxes [photo by Maria Bernander]. Measuring atmospheric mercury on a cruise in the West Atlantic Ocean. The Tekran system to measure mercury with is located on the side of the ship. During the campaign atmospheric and surface ocean gaseous elemental mercury was measured in order to investigate changes in air-sea fluxes [photo by Maria Bernander]. 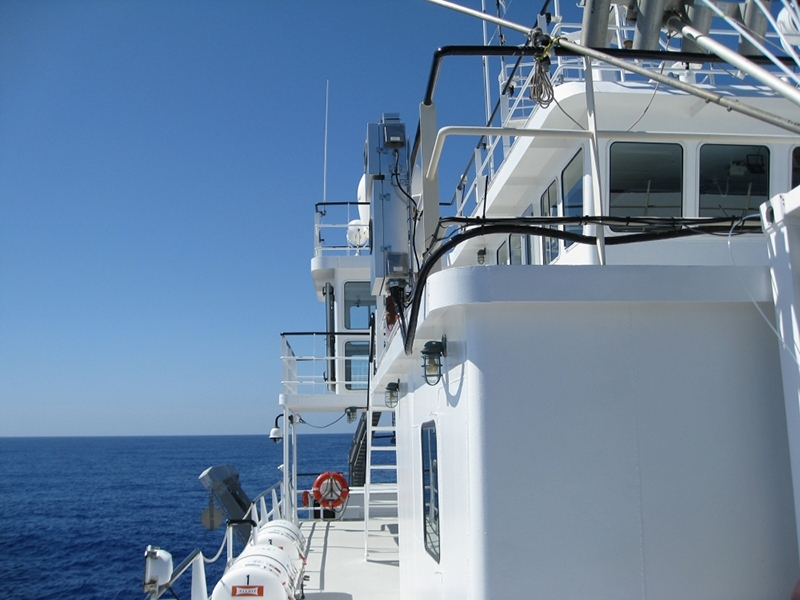 Mercury instrument set up above the prow of the ship during one of the ongoing series of Med-Oceanor cruise campaigns aboard the Italian Research Council's R.V. Urania, in the Mediterranean Sea [Photo by CNR-IIA]. Rain sampler used to collect samples to look at wet deposition of mercury [photo by Maria Bernander]. during an aircraft campaign (NOMADSS study) over the South Eastern US. During the campaign mercury was sampled near urban areas, near industrial point sources and in the free troposphere [Photo by Jaffe Research Group]. The Ev-K2-CNR Pyramid Laboratory/Observatory (5,050 meters a.s.l.) in Nepal at the base of Mount Everest Overlooking the Khumbu Glacier. Mercury has been continuously measured at the Mace Head Research Station (Ireland) since 1995. The station receives air from the Atlantic Ocean and continental Europe [photo by Ralf Ebinghaus).